Mr Garcia and Drs Bancroft and Cole have no relevant financial relationships to disclose. Correspondence should be addressed to: Laura W. Bancroft, MD, Department of Radiology, Florida Hospital , 600 E Rollins, Orlando , FL (laura.bancroft.md@flhosp.org). A 50-year-old woman with a history of myeloma presented with left hip pain (Figure 1). She was status post radiation therapy for a large left innominate bone plasmacytoma. She sustained a pathologic acetabular fracture as a result of this lytic lesion and underwent excision of the pelvic tumor with extensive surgical reconstruction, including total hip arthroplasty and bone allograft. Figure 1: Anteroposterior radiograph of the pelvic showing an expansile lytic lesion involving the left ilium (arrows), with superior migration of the femoral head due to acetabular involvement (A). Axial computed tomography scan with contrast showing the expansile mass (asterisk) involving the entire ilium, with cortical destruction (B). Coronal T1-weighted (C) and fast spin echo T2-weighted (D) magnetic resonance images showing the mass (asterisks), which is isointense to skeletal muscle on the T1-weighted image and hyperintense on the T2-weighted image. Management and treatment of myeloma is based on staging using the Durie-Salmon PLUS staging system, which takes into account the patient’s hemoglobin, serum calcium, radiographic evidence of lytic bone lesions, M-protein level, and renal function.3 Prognosis is highly variable, with survival ranging from months to up to 10 years.4 Recently, an expanded role for imaging has evolved in the staging of disease and in assessing for early response to therapy. Clinical presentation of patients with myeloma varies from incidental findings on routine blood tests to life-threatening disease resulting from the effects of bone marrow infiltration by the malignant plasma cells. Classically, patients present with bone pain and fatigue.5 Pathologic fractures due to lytic destruction of bone may occur, as may renal insufficiency secondary to the hypercalcemia and deposition of the monoclonal light chains in the collecting tubules.6 Other symptoms include infections, increased bleeding, nonspecific radicular pain, and hyperviscosity syndrome. Traditionally, staging of myeloma has been accomplished using the International Scoring System (ISS) and the Durie-Salmon system. Recently, the Durie-Salmon system was updated to include magnetic resonance imaging (MRI) or 2-deoxy-2-(18F)fluoro-D-glucose positron emission tomography (FDG-PET) and is now known as the Durie-Salmon PLUS system.9 The ISS is not a true staging system that quantifies tumor burden, rather, it is used only for prognostication in patients who meet all criteria for having myeloma. This accounts for the fact that other disease processes can result in elevated levels of β2-microglobulin and renal dysfunction without patients having myeloma (eg, patients with monoclonal gammopathy of undetermined significance and comorbid diabetes mellitus).10 For this reason, it is recommended that the ISS be used in conjunction with the Durie-Salmon PLUS system. A relative paucity of literature exists on the new Durie-Salmon PLUS staging system; however, recent studies have identified that a significant number of patients will be understaged using the previous system, which used radiographs for the skeletal survey compared with those staged using the Durie-Salmon PLUS system; this may result in patients not being managed aggressively enough.9 This article further evaluates the current use of imaging for the skeletal survey. Historically, a complete skeletal survey using radiography was undertaken at diagnosis with myeloma (Figure 1A). Approximately 80% of patients will have radiographic evidence of skeletal involvement at diagnosis, most commonly involving the vertebrae but also seen in the ribs, skull, shoulder, pelvis, and long bones.11 This imaging modality is more sensitive than MRI in detecting cortical bone lesions; however, 30% to 50% of bone mineral density must be lost for it to be evident on radiographs. Furthermore, radiographs have a high false-negative rate of up to 67%, which leads to understaging the disease, and lack the ability to accurately address bone marrow involvement.12 Lastly, due to the multiple positions required to conduct the skeletal survey, this method proves difficult for patients suffering bone pain due to their myeloma. The FDG-PET uses labeled fluorodeoxyglucose to indicate tumor burden because metabolically active tumor cells have a propensity to uptake this glucose analogue. Studies using this imaging method are ongoing, with the hope that they will better detect early stages of bone marrow involvement in patients thought to have solitary plasmacytomas.16 The most important advantage of FDG-PET is its ability to distinguish active myeloma from monoclonal gammopathy of undetermined significance.16 Furthermore, unlike MRI, which requires a prolonged time interval prior to noticeable changes on imaging, this imaging modality can be used to demonstrate successful treatment because fluorodeoxyglucose uptake decreases within the myelomatous lesion rapidly following successful therapy.17 However, whole-body MRI performed better overall than did FDG-PET in the assessment of disease activity in a study by Shortt et al,18 having a higher sensitivity (68% vs 59%, respectively) and specificity (83% vs 75%, respectively). Skeletal lesions are present in approximately 60% of patients with a diagnosis of myeloma and may result in pathologic fractures. The portions of the skeleton most commonly affected by these lytic lesions are the vertebrae and long bones. The decision to stabilize such lesions is made by the orthopedic surgeon, with the general rule being that surgical fixation is required if more than 50% of cortical bone loss has occurred. The spine is particularly susceptible to pathologic fracture due to myelomatous lesions.27 For this reason, a significant amount of literature exists regarding the use of kyphoplasty and vertebroplasty for the treatment of myeloma of the spine. The primary indications for these procedures in myeloma are pain control and the prevention or improvement of neurological deficits in patients with a life expectancy of more than 3 months.14 These procedures are minimally invasive and are used for the stabilization of fractures secondary to osteoporosis and osteolytic lesions. The current patient had a left acetabular fracture as a result of the large solitary plasmacytoma in her pelvis. The patient underwent intralesional pelvic allograft fixation. This was accomplished with transsacral screws providing skeletal support for total hip arthroplasty. Accurate placement of the transsacral screws required a 2-approach technique. The patient was initially placed in the supine position for placement of percutaneous transsacral wires. Following successful wire placement, the patient was repositioned in the lateral position and underwent an iliofemoral approach for tumor debridement and graft sculpting, graft fixation, and total hip arthroplasty. The patient tolerated the procedure and was then transferred to the recovery room, where examination revealed excellent range of motion and full sensation. 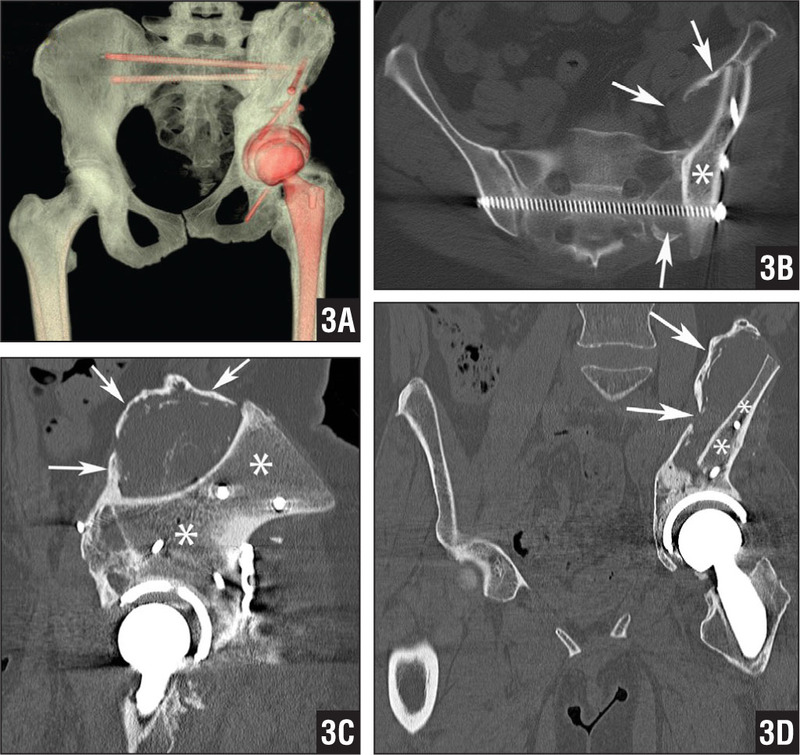 Postoperative radiographs (Figure 2) and CT (Figure 3) confirmed curettage and cementation of the left iliac myelomatous lesion and optimal positioning of the cadaveric iliac graft, 2 fully threaded screws across the sacroiliotic joints, posterior column plate and screw fixation, and hybrid left total hip arthroplasty. Subsequent clinical and imaging follow-up revealed no evidence of local tumor recurrence or hardware failure to date. The patient continues to live symptom free of her plasmacytoma at 6-year follow-up. 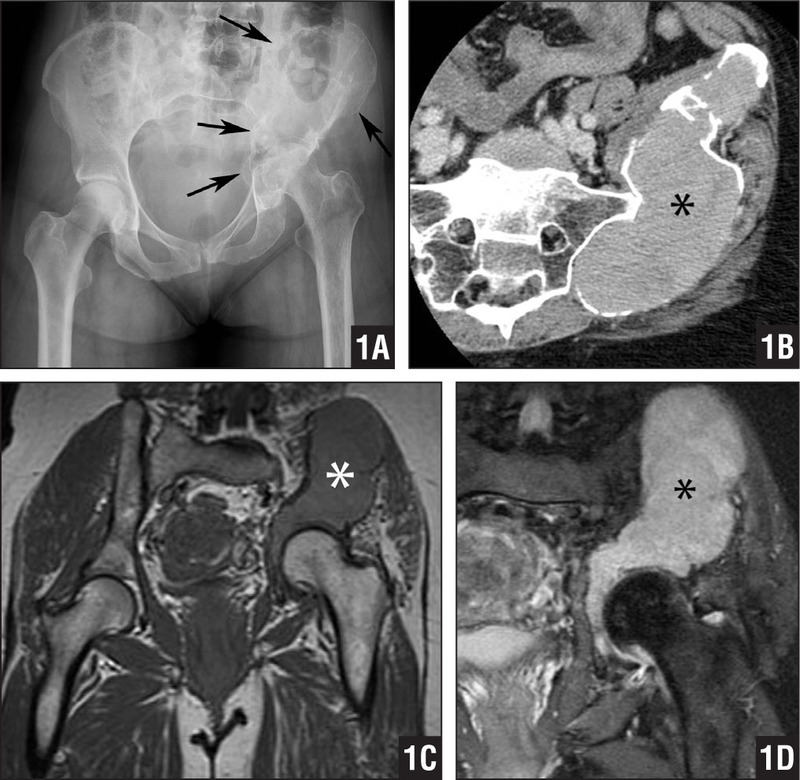 Figure 2: Anteroposterior (A) and lateral (B) radiographs after curettage and cementation of the left iliac myelomatous lesion, cadaveric iliac graft, 2 fully threaded screws across the sacroiliac joints, posterior column plate and screw fixation, and hybrid left total hip arthroplasty. Figure: Radiograph (A), computed tomography scan (B), and magnetic resonance image (C).